On May Day we always close the store in solidarity with the workers of the world. Our hearts go out to the families that lost loved ones in the collapsed garment factory in Bangladesh. We take this time to remind us and our community of our commitment to workers rights all over the world. Below is a copy of a sign we put in our window that helps explain the events of the Hay Market riots. May 1st, International Worker’s Day, commemorates the efforts by workers throughout the world to attain control over their labor. Though the day has its historical roots and was first celebrated in the United States, we are one of the few countries where it is currently not a holiday. International Worker’s Day began in the 1880’s with the struggle for an eight hour work day. Support for the movement grew quickly for at that time laborers were often working 12-14 hour days. The most famous event in May Day history took place in 1886 at Haymarket Square. There, on the evening of May 4, a meeting was called in support of strikers who were killed the day before. 3,000 persons assembled. As the hour grew late and the crowd dwindled to a few hundred a detachment of 180 policemen showed up, advanced on the speakers’ platform, and ordered the crowd to disperse. A bomb exploded in the midst of the police, wounding sixty-six policemen, of whom seven later died. The police fired into the crowd, killing several people, wounding two hundred. With no evidence of who threw the bomb, the police arrested eight anarchist leaders in Chicago. The evidence against the eight anarchists was their ideas, their literature; none had been at Haymarket that day except one, who was speaking when the bomb exploded. All eight were found guilty and sentenced to die, four were hanged, one killed himself in jail, and three remained in prison. To this day it has not been discovered who threw the bomb. While the immediate result was the suppression of the radical movement, the long term effect was to keep alive the class anger of many. Sixty Thousand people signed petitions to the new governor of Illinois, who investigated the facts, denounced what had happened and pardoned the three remaining prisoners. It is this event, both the tragedy of Haymarket and the labor victories which followed, that we remember on this day. 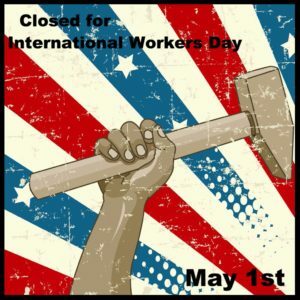 The Cheese Board has celebrated International Worker’s Day for the past 40 years by closing on May 1st. We choose to spend the day together, enjoying a picnic and discussing the beliefs that underlie our business philosophy and have brought us, as workers to the Cheese Board. For us May Day is not only a day to remember the past, but also a day to recognize that labor struggles still exist throughout the world. We celebrate labor on a day which has historical significance and political context to workers in other countries as well. We hope that you, our customer, will support us in our celebration of workers throughout the world.